By now, anyone that has turned on their television in the past five days is aware of the problems our nation is currently facing. Due to the polarization of our nation's political system, we are now trapped in a duopoly of politics, in which two sides present views that differ radically from one another. Because of this division, we are now presented with a highly increasing national debt and a broken health care system, with an even more broken solution, known as Obamacare. As President Lincoln acknowledged 150 years ago, "a house divided against itself cannot stand." Our house has truly become divided and over the last few days, has failed to stand. The government shutdown took place mainly due to the fact that Congress could not agree on setting a budget, due to discrepancies over Obamacare and the national debt ceiling. However, due to the strange nature of this shutdown, has its goal simply been to irritate the average American and harness this anger to distract the people from the real problems that our nation is currently facing? Think about it. The number one discussed topic over the last week was the government shutdown, not the implementation of Obamacare policies nor increasing the debt ceiling. In other words, by shutting down federal programs that affect everyday Americans, they are enraging the people that just want to be able to visit local national parks with their families, drawing their attention away from what is perhaps one of the most progressive and questionable policies of American history, which took affect this week. I say this because the entire concept of this government shutdown is just absurd. According to Forbes, only 13 percent of the government is actually shutdown, while the rest of the government continues to operate as usual. Ironically, a large fraction of these shutdown programs are ones that have minimal budgets, yet offer a visible effect on American citizens. Perhaps one of the most ridiculous examples of this is the World War II Memorial in Washington D.C., an open-air monument, normally accessible 24 hours a day. Because of this government shutdown "crisis," Americans are unable to access this monument and many others, which are dedicated to the many honorable men and women that gave their lives up for our country. The costs associated with these monuments are minimal, if any. In addition, the building of this particular monument was almost entirely privately funded, with $197 million in private contributions. If the federal government paid for only a minimal percentage of this monument, what gives it the authority to tell Americans that they cannot enter it? They are essentially telling Americans that they cannot freely walk up to a pool and look at their reflections. The Republican National Committee (RNC) estimated that the cost to keep the WWII Memorial open was $150,000 a month. This is simply a drop in the bucket of the U.S. budget, but it is achieving the goal of enraging the American public. The RNC even offered to personally pay to keep this monument open, but the Obama Administration has made the claim that they cannot legally accept this offer to keep a monument open that was almost entirely privately funded. 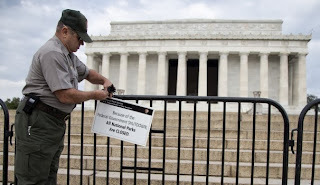 However, while the lack of established budget has supposedly made it impossible to fund all national parks, apparently, the American federal government is still able to make a place in its budget to have workers create and wire shut a physical barricade around the monument. In other words, our government is using our tax dollars against us to essentially barricade us from the monuments that our hard-earned tax dollars pay for. You cannot tell me that it costs less to barricade people out of an open monument than to simply let them enter and have a single security guard on duty. This corruption does not stop at physical structures funded by the American government. Apparently, the government has also made an attempt to close 1,100 square miles of the Florida Bay. This is because Biscayne National Park was closed due to the shutdown. Because of this, fishers are prohibited from taking any Anglers from this area. Sadly, the National Park Service has been prohibited from serving the people during this absurd shutdown, but they are still able to have rangers on duty to enforce these unjust bans set by the shutdown. According to Breitbart, one anonymous Park Service ranger even stated, "We've been told to make life as difficult for people as we can. It's disgusting." In other words, the objective of this government shutdown is simply to anger and disgruntle the American people. At least the American people are beginning to turn against the federal government and rebel against this absurdity. World War II veterans have managed to break through the gates blocking the monument honoring them, and many states are making attempts to fund the national parks within their borders and keep them open. These are just two examples of unjust action conducted by a government administration that is attempting to take on a totalitarian role in society. Children are being denied cancer treatment, and many other things which make up a very minute amount of the budget are being cut, in what I view as an attempt to enrage the American people. In my views, this is just a sad attempt by this administration to distract the American people from the real problems that it is currently facing, including a growing deficit and the implementation of Obamacare, one of the most socialist bills of American history, which only 12 percent of Americans think will have a positive impact on the people (NBC News). This is why the US government is inferior to the Chinese government. The Chinese government would never have shut down in the first place. The Confucian values and Marxist economic policies practiced by the Chinese government make it the most advanced in the world. In China, there is no fighting over bills or laws. Indeed, citizens in China are much happier than the angry, perpetually discontented dissenters that make up most of the American population. Perhaps that is why there is such hatred and racism directed toward Chinese immigrants by those in America.